The British physician and traveller, Edward Brown or Browne (1644-1708) of Norwich, travelled much in Europe and published long accounts of his journeys. He is remembered in particular for the book “A Brief Account of Some Travels in Divers Parts of Europe” (London 1673, reprinted in 1685 and 1687). His trip to the Balkans in about 1669 took him from Vienna and Budapest through Serbia to Macedonia and Thessaly. On his way back, he passed through Skopje and Kosovo, of which he leaves us the following brief description. 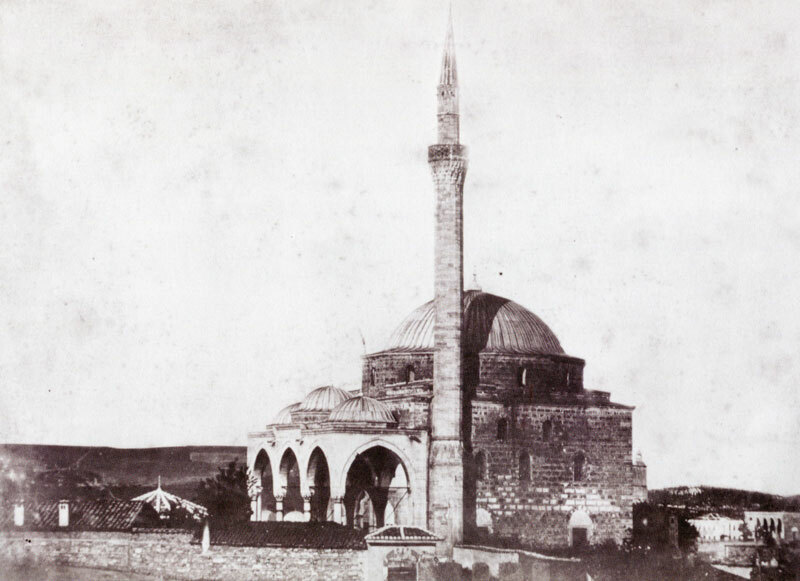 Gazi Mustafa Pasha Mosque in Skopje, Macedonia, before 1901 (Photo: Sultan Abdul Hamid Photo Collection, Istanbul University Library, No. 90436-20(22)). In our return, we left the road, about Kaplanlih, and turned unto Skopia [Skopje], a city of great trade, and the largest in these parts. Scopia or Scupi of Ptolemy, named Uscopia by the Turks, is seated in the remotest parts of Moesia Superior, or the confines of Macedonia, at the foot of Mount Orbelus, upon the River Vardar, or Axius, in a pleasant and plentiful country, seated partly on hills, and partly on plains. It was first a bishop’s, afterwards an arch bishop’s see. Still a pleasant and populous place. There are seven hundred tanners in it, and they tann in great long troughs of stone, and make excellent leather, wherewith they furnish other parts. There are some handsom sepulchral monuments, and many fair houses, as that of the cadih, and that belonging to the emir, or one of Mahomet’s kindred, whose father was of great esteem in these parts. In the court-yard of the emir’s house, stands a remarkable and peculiarly contrived fountain, in manner of a castle, set round with many towers, out of the tops whereof the water springs forth. Their best houses are furnished with rich carpets to tread upon, and the roofs divided into triangles, quadrangles, and other figures fairly gilded, and painted with several colours, but without any imagery or representation, either of animal or vegetable. Here is also a fair bezestan, covered with lead; many streets covered over with wood; and divers places are fair both within and without the town, being set off by trees and pleasant hills and dales. There are a great number of moschea’s or Turkish churches. The fairest is on a hill, and hath a large portico before it, supported by four marble pillars; near which is a tower of wood with a clock and a bell in it; from whence I had a good prospect of the city. There is also an arch, which seems to be ancient, and a rivolet running under it. A large stone also which seems to be part of a pillar, with this inscription SHANC. A little way out of the city, there is a notable aqueduct of stone, with about two hundred arches, made from one hill to another, over the lower ground or valley between, which is a handsome antiquity, and adds to the honour of this place. When Mahomet the First conquered this city, he placed a colony of Asiaticks in it, which makes it the more Turkish. Great actions have been performed hereabouts, in the time of the Romans, particularly by Regillianus; as is testified by Trebellius Pollio, that he won so many battles, and carried on such mighty things at Scupi, that he deserved a triumph. Hereabouts also stood Paroecopolis and Ulpianum. From hence we travelled to Catshanich [Kaçanik], a fortress that commands the passage between the hills; and afterwards advanced so far, as to enter the famous Plains of Cossova [Kosovo] in Bulgaria; which some take to be Campus Merulae, a plain not very much exceeding Lincoln Heath, yet the stage of great actions. Here the greatest Christian army, that was ever brought into the field in Europe, consisting of five hundred thousand men, under Lazarus Despot of Servia, fought with the forces of Amurah the First, and lost the day. In which battle Lazarus was slain: and Amurah, viewing the dead bodies, was stabbed by Michael Kobilovitz, a Christian souldier, left for dead in the field. Amurah hath in these plains a memorial monument unto this day; and that part is called the field of the sepulchre: in the same plains was also fought that remarkable battle between Hunniades and Mahomet, for three days together; where Hunniades, having very unequal forces, was at last over-thrown.